Borderline Offensive Friesland and its Artist in residence – the Slovak theatre director Peter Gonda – search for participants in a series of theatre workshops that will take place from July 11 to 14 at Keunstwurk. Workshop hours will be determined in concentration with the participants. 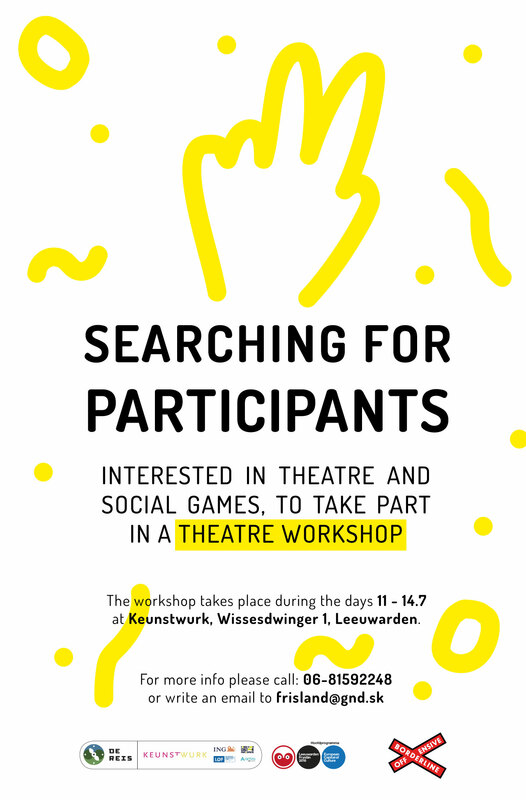 The workshops will explore the possibility to develop a new collaborative game for several participants, that would at the same time be physical and utilize theatre techiques and also have a virtual computer-game component. Utilizing creative games, theatre exercises and various techniques borrowed from practitioners like Augusto Boal, Dymphna Callery, Keith Johnstone or Viola Spolin, the workshops will also work on various actor and ensemble techniques. Peter Gonda is a Slovak theatre director, visual artist and journalist. He holds a masters degree from Theatre directing at the DAMU Theatre Academy in Prague, being interested in non-dramatic performance devised with groups of non-actors. Click for more info about borderline offensive!